Now you can get knowledge about Pakistan Army CSD December 2015 Application Form Download Latest. CSD Stand for Canteen Stores Department it works under the Pakistan army. So you all know about Pakistan army and its respect in society. Pakistan army is one of the best armed forces in world. Everyone wants to join Pakistan army regard less knowing the positions. Because some people wants to join Pakistan army as a soldier, some are as a officer, some are as head cook, driver and for some are for MP positions. So everyone wants the tag of army with their names. 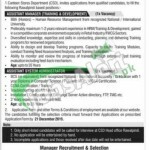 Now Pakistan army looking to hire new individuals for the position of Assistant Manager for training and development department and for the position of Assistant system administrator. Assistant Manager for the training and development department. Applicants download the application form from the link given below in this post. Applicants have to send the all documents like CV along all attested copies of CNIC, Domicile, passport size photographs, experience certificates and all other experience certificates. Candidates have to send all documents at this address: CSD Head Office, Post Box NO. 1039, 265-Muhammad Hussain road, near RA bazaar, Saddar Rawalpindi. Last date of submitting the applications is 21st December, 2015. After the due date all applications will be rejected. All Hand written applications will not be entertained. Only those candidates will be called for interview who meets the requirement criteria. All irrelevant material and incomplete applications will not be entertained. Address: CSD Head Office, Post Box NO. 1039, 265-Muhammad Hussain road, near RA bazaar, Saddar Rawalpindi.